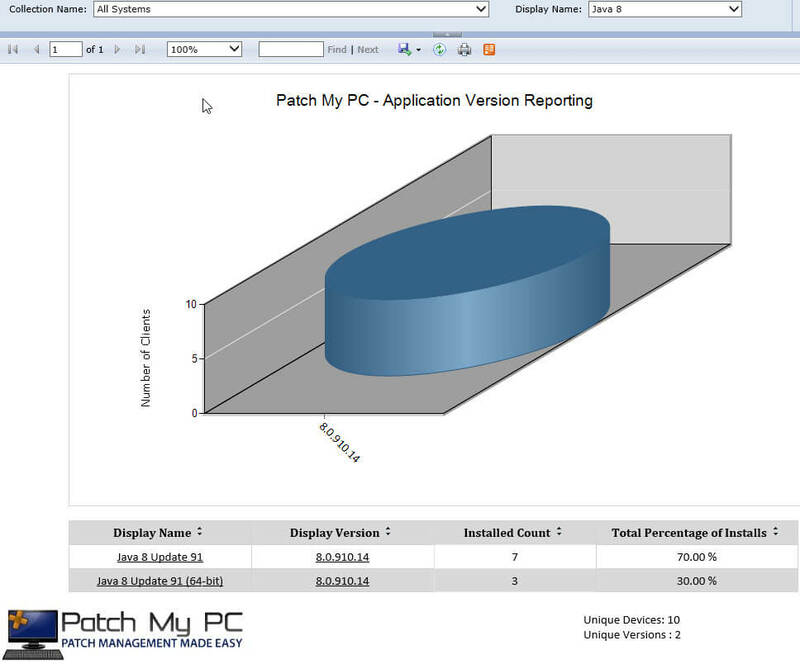 The most critical aspect of patch management in System Center Configuration Manager is to be able to report on update compliance easily and accurately. 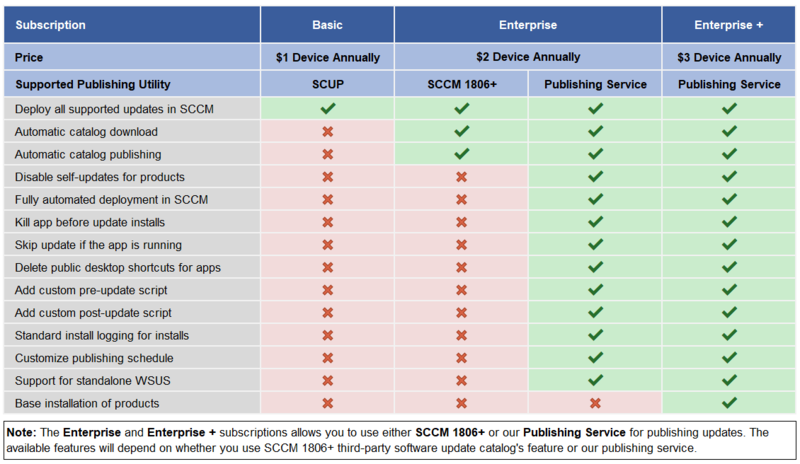 Many of the native reports available in SCCM aren’t easily understood. Our team has updated and created a simple install for the dashboards created originally from Microsoft employee Gary Simmons. How to install the reports: Download the publishing service MSI by clicking the button below, install it, and run the Report Installer from the advanced tab. Please review the YouTube video below for step-by-step setup and instructions and an overview of the reports. For more detailed information about each report, please expand the toggle’s below to learn more. This report is one of the main software update dashboard reports. This report shows overall update compliance information for a specific collection of devices. This report has many clickable links to drill down to sub-reports. Assets Section: This list the number of workstations and servers in the environment. Software Update Information: This list of percentage of updates installed for a specific month. Workstation Compliance: This shows the workstation compliance for different scenarios. Overall Compliance Chart: This shows the percentage of Windows 7, Windows 8.1, and Windows 10 that are 100% compliant for all available updates. Workstations Missing Software Updates Chart: This chart list the number of machines missing a specific number of updates: 1-10, 11-25, 26-50, >50. Percentage of Workstations 100% Compliance by Month Chart: This chart shows the percentage of Windows 7, Windows 8.1, and Windows 10 machines that are 100% compliance for all updates in a specific month. Workstations Missing At Least 1 Update By Month Chart: This shows the count of Windows 7, Windows 8.1, and Windows 10 devices missing at least 1 update for a specific month. Server Compliance: This shows the workstation compliance for different scenarios. Overall Compliance Chart: This shows the percentage of Windows Server 2008, Windows Server 2008 R2, Windows Server 2012, Windows Server 2012 R2 that are 100% compliant for all available updates. Servers Missing Software Updates Chart: This chart list the number of machines missing a specific number of updates: 1-10, 11-25, 26-50, >50. 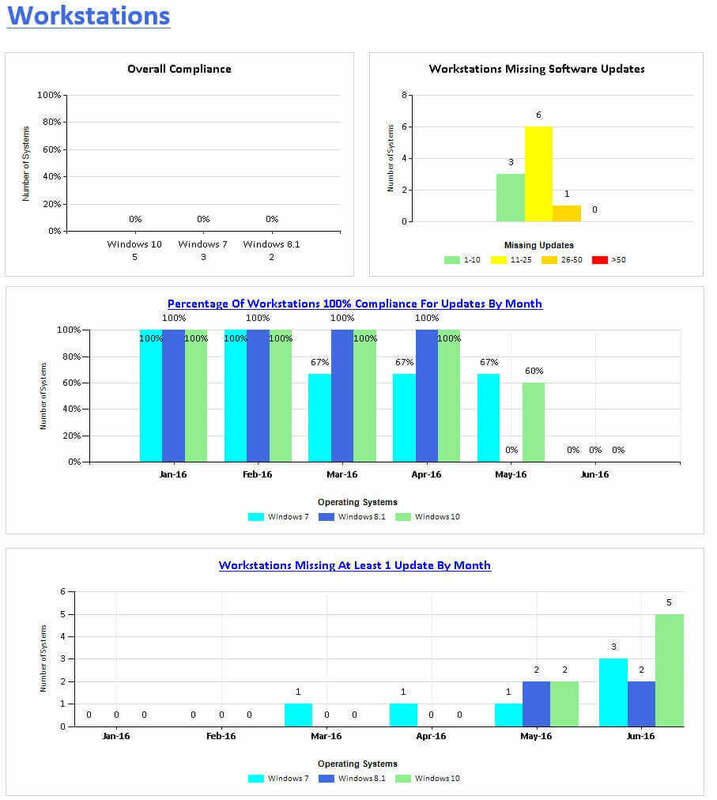 Percentage of Servers 100% Compliance by Month Chart: This chart shows the percentage of Windows Server 2008, Windows Server 2008 R2, Windows Server 2012, Windows Server 2012 R2 machines that are 100% compliance for all updates in a specific month. 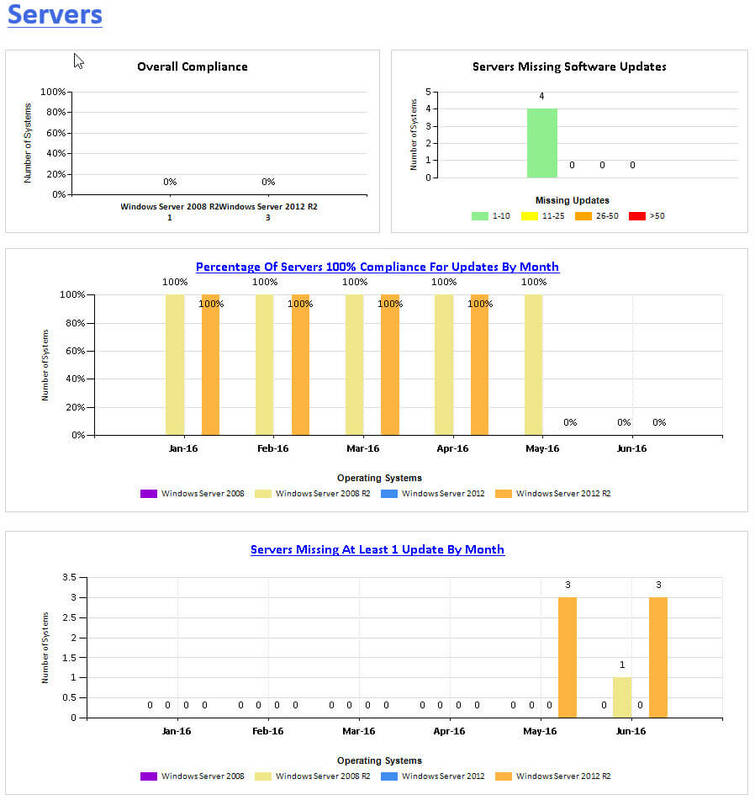 Servers Missing At Least 1 Update By Month Chart: This shows the count of Windows Server 2008, Windows Server 2008 R2, Windows Server 2012, Windows Server 2012 R2 devices missing at least 1 update for a specific month. This report is one of the main software update dashboard reports. This report shows overall third-party update compliance information for all devices in the environment. This report has many clickable links to drill down to sub-reports. Assets Section: This list the number of workstations and servers in the environment. This report is one of the main software update dashboard reports. This report shows overall third-party update compliance information for all devices in the environment. This report has many clickable links to drill down to sub-reports. Assets Section: This list the number of workstations and servers in the environment. Systems Missing Software Updates Chart: This chart list the number of machines missing a specific number of updates: 1-10, 11-25, 26-50, >50. Overall Compliance: This shows the workstation compliance for different scenarios. 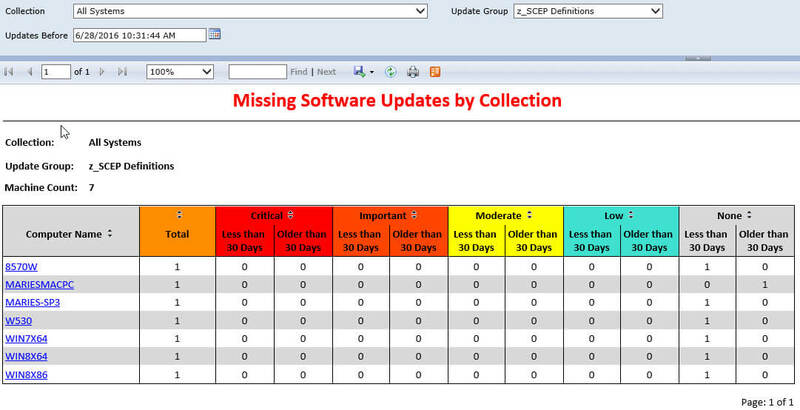 Overall Compliance Chart: This chart shows the overall compliance for updates that are either installed or required for a specific software update group. 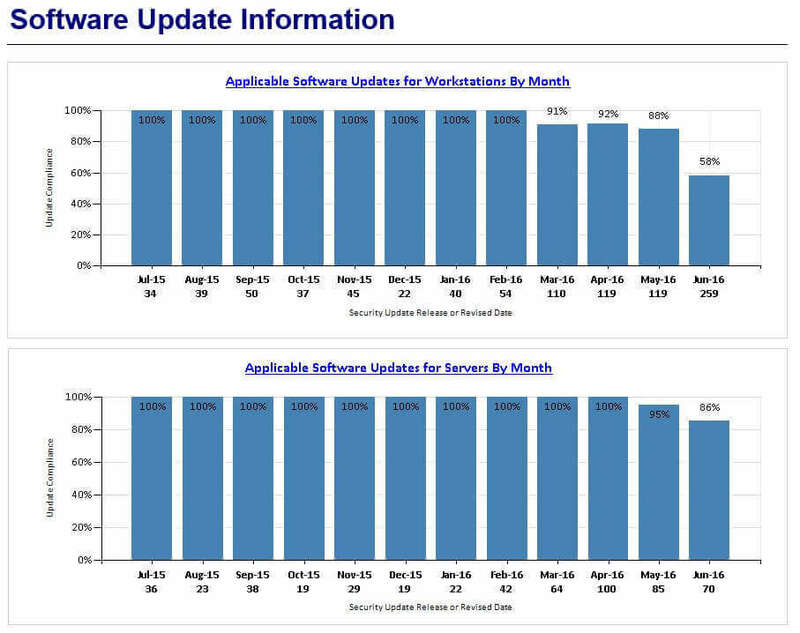 Applicable Software Updates Chart: This chart shows the overall compliance for updates that are either installed or required for a specific software update group for the last 12 months by month. This report allows you to choose a collection and a specific software update group and review the compliance results by machine. [/expand][expand title=”04 – Installed Third-Party Applications” tag=’h2′] This report allows you to choose a specific application from the applications in our SCUP catalog and show how many unique versions are installed in the environment. This report allows you to choose a specific application from the applications in our SCUP catalog and show how many unique versions are installed in the environment. This report is a sub-report of 03 – All Software Updates Missing By Collection. This will show all the updates missing by a specific device. This report is a sub-report of 04 – Installed Third-Party Applications. This list all devices with a specific application or a specific application and specific application version installed. This is a sub-report of the software update dashboard. 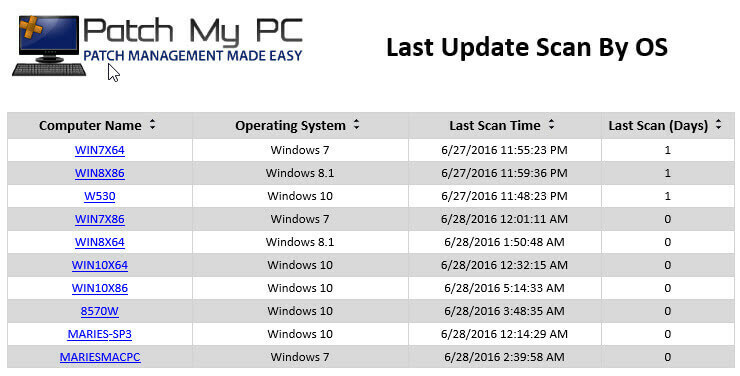 This allows you to see the last software update scan by workstation, server, or specific operating system. This is a sub-report of the software update dashboard. This report shows third-party updates and their compliance status for specific months or date ranges. This is a sub-report of the software update dashboard. This allows you to see how many third-party updates are missing for each device. This is a sub-report of the software update dashboard. This report shows updates and their compliance status for specific months or date ranges. This is a sub-report of the software update dashboard. This allows you to see how many updates are missing for each device.